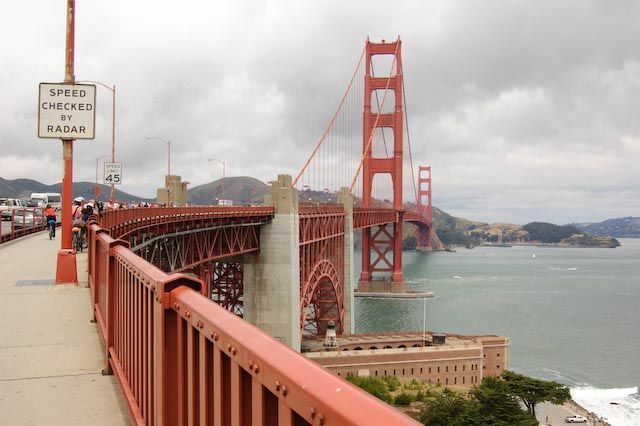 A trip to San Francisco isn't complete without a few typical touristy experiences; a ride on the cable car, a walk up Haight Street, a picture in front of windy Lombard Street, and who can forget the Golden Gate Bridge? There is, of course, the obligatory picture in front of the bridge, and maybe a drive across if you have access to a car. 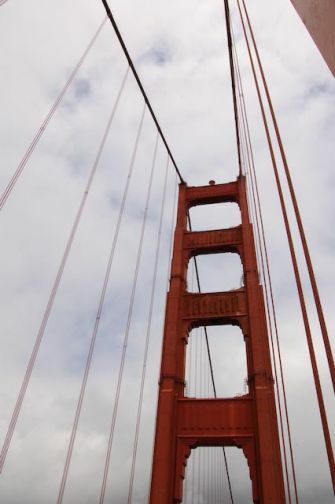 But, one of the best ways to experience the Golden Gate Bridge is to hire a bicycle and ride across. There are several companies to rent from, all offering similar products at similar prices. If you pick up one of the tourist maps available at most hotels, there are usually discounts for $5 off bike hire at several companies on the back. Given that it can cost up to $40 without the discount, it is well worth your while. Generally riders will start their day somewhere near Pier 39 - 43. The ride takes you along the shoreline for about half an hour before hitting the bridge. The views are spectacular and there are many opportunities for photos stops along the way. There are a couple of steep uphill sections before you hit the bridge, but do not be deterred, many people simply get off and walk their bike up. The ride across the bridge is about 20 minutes long, including a few photos stops and tourist traffic jams. The entire experience is somewhat surreal, like all of a sudden being in a movie. After the bridge there is a nice downhill ride to Sausalito. Many riders stop in this small town for lunch, and then get the ferry back to San Francisco. More enthusiastic riders can continue for another hour or so to Tiburon and get the ferry from there. Most ferries go to Pier 1, but it's a lovely ride back along the esplanade to the bike shops. Each rental company will provide you with a ferry pass to get back from Sausalito or Tiburon, but beware, this is not included in the price and will set you back around $9.50. Despite the $33 price tag (after $5 discount and including the ferry ticket) this ride is well worth it. It's a unique and inspiring way to see San Francisco.